In the 19th century, the country had similar characteristics to other Latin American countries: caudillism, civil wars and permanent instability (40 revolts between 1830 and 1903), foreign capitalism's control of important sectors of the economy, high percentage of illiterate people (more than half the population in 1900). José Batlle y Ordóñez, President from 1903 to 1907 and again from 1911 to 1915, set the pattern for Uruguay's modern political development and dominated the political scene until his death in 1929. Batlle introduced widespread political, social, and economic reforms such as a welfare program, government participation in many facets of the economy and a new constitution. Batlle nationalized foreign owned companies and created a modern social welfare system. Income tax for lower incomes was abolished in 1905, secondary schools established in every city (1906), telephone network nationalized, unemployment benefits were introduced (1914), eight-hour working day introduced (1915), etc. Claudio Williman who served between Batlle’s two terms was his supporter and continued all his reforms, as did the next President Baltasar Brum (1919–1923). Around 1900 infant mortality rates (IMR) in Uruguay were among the world's lowest, indicating a very healthy population. The number of trade unionists has quadrupled since 2003, from 110,000 to more than 400,000 in 2015 for a working population of 1.5 million people. According to the International Trade Union Confederation, Uruguay has become the most advanced country in the Americas in terms of respect for "fundamental labour rights, in particular freedom of association, the right to collective bargaining and the right to strike. Uruguay has a partially dollarized economy. As of August 2008[update] almost 60% of bank loans use United States dollars, but most transactions use the Uruguayan peso. Although this is a sector that does not make substantial contributions to the country's economy, in recent years there have been some activity in gold and cement production, and also in the extraction of granite. Due to two major investments made in 1991 and 1997, the most significant manufactured exports in Uruguay are plastics. These investments laid the way for most of the substantial exports of plastic-based products which has taken a very important role in Uruguay's economy. In spite of having poor levels of investment in the fixed-line sector, the small size of Uruguay's population has enabled them to attain one of the highest teledensity levels in South America and reach a 100% digitalization of main lines. Although the telecommunications sector has been under a state monopoly for some years, provisions have been made to introduce liberalization and to allow for entry of more firms into the cellular sector. Cattle were introduced to Uruguay before its independence by Hernando Arias de Saavedra, the Spanish Governor of Buenos Aires in 1603. Beef exports in 2006 amounted to around 37% of Uruguayan exports. Wool is a traditional product exported mainly to America, followed by the UK and India. Milk and dairy products. Conaprole, National Cooperative of Milk Producers is the main exporter of dairy products in Latin America (in 2006). The area of the country dedicated to the dairy food is located mainly in the south west. Rice. Fine varieties are produced in the lowlands in the east of the country close to Merin lake on the Uruguay-Brazil border. The national company Saman claims to be the main exporter in Latin America. Countries it exports to include Brazil, Iran, Peru, South Africa, Chile, Senegal, Argentina, Paraguay, Bolivia, Ecuador, USA, Canada and China. Tourism: Several seaside resorts, like Punta del Este or Punta del Diablo in the south-eastern departments of Maldonado and Rocha, regarded as a jet set resort in South America, are main attractions of Uruguay. International cruises call at Montevideo from October to March every year. Also, Uruguay hosts many year-round international conferences. (The original GATT Uruguay Round concerning trade was, as its name suggests, hosted in Uruguay). Montevideo is home to the headquarters (secretariat) of [Mercosur], the Common Market of the South, whose full members are Uruguay, Argentina, Brazil, Paraguay and Venezuela, associate members Bolivia, Chile, Colombia, Ecuador and Peru. Software and consulting. Uruguay's well-educated workforce and lower-than-international wages have put Uruguay on the IT map. A product named GeneXus, originally created in Uruguay by a company called ArTech, is noteworthy. Other important developers and consultants include De Larrobla & Asociados, Greycon and Quanam. Tata Consultancy Services has its headquarters for the Spanish speaking world in Uruguay. Many of these companies have established in Zonamerica Business & Technology Park. "With a population of only three million, Uruguay has rapidly become Latin America's outsourcing hub. In partnership with one of India's largest technology consulting firms, engineers in Montevideo work while their counterparts in Mumbai sleep." - The New York Times, Sep 22, 2006. Banking Services. Banking has traditionally been one of the strongest service export sectors in the country. Uruguay was once dubbed "the Switzerland of America", mainly for its banking sector and stability. The largest bank in Uruguay is Banco República, or BROU, which is state-owned; another important state bank is the BHU. Almost 20 private banks, most of them branches of international banks, operate in the country (Banco Santander, ABN AMRO, Citibank, among others). There are also a myriad of brokers and financial-services bureaus, among them Ficus Capital, Galfin Sociedad de Bolsa, Europa Sociedad de Bolsa, Darío Cukier, GBU, Hordeñana & Asociados Sociedad de Bolsa, etc. Uruguay has fully recovered from the financial crisis that caused a run on its banks. Public Sector: The state in Uruguay has an important role in the economy, Uruguay resisted the trend of privatization in Utilities and state owned enterprises in the region. Several Referendums supported the state being in control of the most important utilities and energy companies. Some of the companies have a full monopoly warranted by law (like landline telephony, water), others compete freely with private operators (Insurance, mobile telephony, Banks). Most of them are dominant in the local market. There is strong debate in the Uruguayan society about their role, and future. Some of them made a contribution to the Uruguay state treasury. 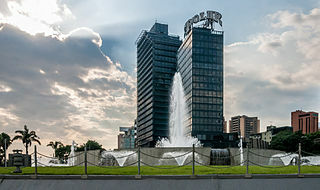 The most important state owned companies are:Republica AFAP (Pension Fund), AFE (Railways), ANCAP (Energy), ANCO (Mail), Administracion Nacional de Puertos (Ports), ANTEL (Telecommunications: Telephony, Mobiles (ANCEL and Data ANTELDATA)), BHU (Mortgage Bank), BROU (Bank), BSE (Insurance), OSE (Water & Sewage), UTE (Electricity). These companies operate under public law, using a legal entity defined in the Uruguayan Constitution called 'Ente Autonomo' (Meaning Autonomic Entity). The government also owns parts of other companies operating under private law like the National Airline Carrier PLUNA and others owned totally or partially by the CND National Development Corporation. The following table shows the position of Uruguay in the world. ^ Data cover general government debt, and include debt instruments issued (or owned) by government entities other than the treasury; the data include treasury debt held by foreign entities; the data include debt issued by subnational entities, as well as intra-governmental debt; intra-governmental debt consists of treasury borrowings from surpluses in the social funds, such as for retirement, medical care, and unemployment; debt instruments for the social funds are not sold at public auctions. ^ a b c d e f g h "World Economic Outlook Database, April 2019". IMF.org. International Monetary Fund. Retrieved 10 April 2019. ^ a b c d e f g h i j k l m n o p q r s "The World Factbook". CIA.gov. Central Intelligence Agency. Retrieved 28 January 2019. ^ "Cuadro 7. Incidencia de la pobreza en personas por área geográfica según año". Estimación de la pobreza por el Método del Ingreso: Año 2014 (in Spanish). Instituto Nacional de Estadística. March 2015. Retrieved 4 December 2015. ^ "Ease of Doing Business in Uruguay". Doingbusiness.org. Retrieved 2017-01-23. ^ Piñón, Marco; Gelos, Gaston (2008-08-28). "Uruguay's Monetary Policy Effective Despite Dollarization". IMF Survey Magazine. Retrieved March 4, 2012. ^ "Uruguay - Travel & Tourism Total Contribution to GDP - Total Contribution to GDP - % share". Knoema. Retrieved 11 June 2015. ^ "Country Reports: Uruguay." Uruguay Country Monitor (2014): 16. Business Source Premier. Web. 7 Dec. 2014. ^ "Conaprole". Conaprole. Retrieved 11 June 2015. ^ "SAMAN. Principal exportador de arroz de América Latina. The leading rice exporter in Latin America". Retrieved 11 June 2015. ^ "Desarrollo de Aplicaciones Empresariales Multiplataforma - GeneXus". Retrieved 11 June 2015. ^ "Bantotal". Bantotal. Retrieved 11 June 2015. ^ "inicio - localhost". Archived from the original on 4 March 2016. Retrieved 11 June 2015. ^ "Pobreza - Instituto Nacional de Estadística". www.ine.gub.uy. Retrieved 2019-02-07. ^ "Mercer | Quality of Living Ranking 2018". www.mercer.com. Retrieved 2019-02-06. ^ "Human Development Data (1990-2017) | Human Development Reports". hdr.undp.org. Retrieved 2019-02-06. ^ Humanity, Vision of. "Global Peace Index". Vision of Humanity. Retrieved 2019-02-06. ^ "Legatum Prosperity Index 2018 :: Legatum Prosperity Index 2018". www.prosperity.com. Retrieved 2019-02-06. ^ "Research - CPI - Overview". www.transparency.org. Retrieved 2019-02-06. ^ "Country Rankings: World & Global Economy Rankings on Economic Freedom". www.heritage.org. Retrieved 2019-02-06. ^ "Reports". World Economic Forum. Retrieved 2019-02-06. ^ "Cost of Living Index. Updated Feb 2019". Expatistan, cost of living comparisons. Retrieved 2019-02-06. ^ "Rating: Calificación de la deuda de Uruguay 2019". datosmacro.com (in Spanish). Retrieved 2019-02-06.